If you wish to be informed about the latest events in the world or if you do not want to miss your favourite TV series also faraway from any civilization, you need a flexible antenna that is well-adapted to your individual needs. The new fully automatic satellite systems are digital and offer you the independence to be able to use your own receiver thanks to their intelligent control units. The new CARO with its elegant 50 x 50 cm flat antenna is only 13 cm high. Thanks to its low overall height and its small space requirement, CARO is the ideal choice for all vehicles where every centimetre counts. 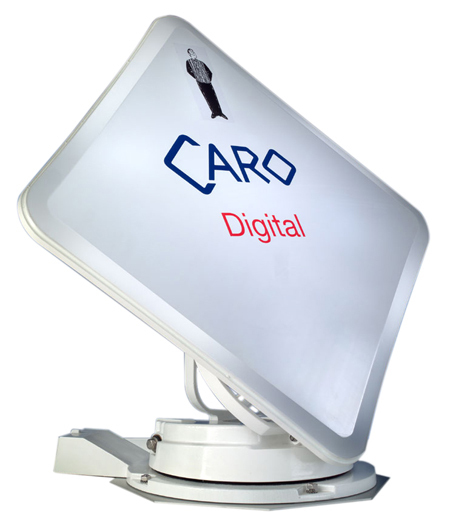 In connection with a digital receiver, CARO provides program variety all over Europe.